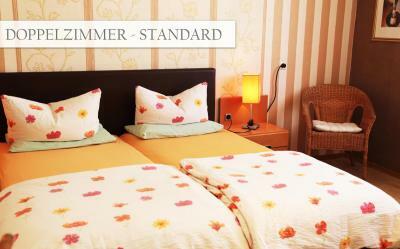 Friendly staff, comfortable room. In close proximity to my place of work, so convenient from a location perspective too. The nearest train/bus station is less than 200 meters away!! Die Küche ist ausgezeichnet etwas grosse Portionen. Sehr freundliches Restaurant Personal. Ich wurde sehr nett Empfangen und das Bett war bequem. Das Zimmer war gut beheizt als ich es betreten hatte. Das Frühstück war sehr ausgiebig und lecker, freundliches Personal. Die Zimmer waren sauber, schöne Einrichtung. Die Duschtüren etwas " klapprig", aber akzeptabel. Alles in allem empfehlenswerte Übernachtungsmöglichkeit. Bilo mi je všeč. Še bom prišel v ta hotel z veseljem. Dobra posteljnina,dober zajtrk in prijazno osebje. Die Zimmergröße war überdurchschnittlich groß, aber das hilft auch nicht beim Rest. Nettes, familiengeführtes Hotel im Stile der guten 80er Jahre. Sehr freundliches und zuvorkommendes Personal. Super Frühstück für kleines Geld. Die Straßenbahn ist auch nachts gut hörbar ;-). Dafür ist sie aber auch gut erreichbar, um in die City zu fahren. Freies, schnelles W-LAN. Ich war für einen Kurtzbesuch in Mannheim und dafür kann ich diese Unteerkunft nur emphehlen, besonders wenn man am tag viel unterwegs ist. Gut mit der Tram zu erreichen und nicht allzuweit vom Stadtzentrum entfernt. 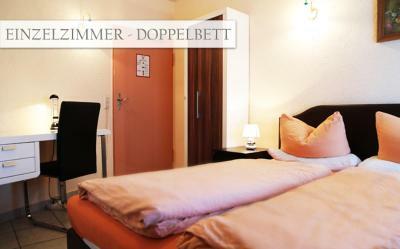 This family-run hotel to the north-east of Mannheim offers modern rooms with cable TV and free Wi-Fi. It enjoys excellent motorway and public transport connections. The Hotel-Restaurant Alexandros offers Greek hospitality and a friendly ambiance. A rich breakfast buffet is available (for an extra cost) at the Hotel Alexandros each day from 06:15. The Alexandros restaurants serves a selection of Greek and international specialties. In fine weather guests can wine and dine in the beer garden of the Hotel-Restaurant Alexandros. When would you like to stay at Hotel Restaurant Alexandros? This room offers cable TV and a private bathroom. House Rules Hotel Restaurant Alexandros takes special requests – add in the next step! Hotel Restaurant Alexandros accepts these cards and reserves the right to temporarily hold an amount prior to arrival. The drainage at the shower seemed slow,. Water would accumulate rather quickly on the floor. The location is practically on top of the tram lines and a busy road, it was very loud all night. When I first tried to enter the room the door jammed, this is because the bathroom door was left open, so when I opened the room door it then hit the bathroom door and became stuck. I had to wedge my arm through the gap to open the door.The room was quite dark and dreary and smelled faintly like a wet dog. I assume the owner allows her pet to enter the room when it's being cleaned... Not all of the lamps worked. The bathroom was exceptionally small, so small in fact that they had to cram a toilet into the corner, diagonally and when you tried to open the toilet lid it would only lift half way because of the angle. If you did manage to sit down you knees would then touch the sink and the bathroom door, all whilst being bent over double! The breakfast was ok. I requested as receipt as I needed one for my business expenses, after assuring me I would receive I receipt the next day they said it wasn't possible. I ended up asking them to write down my expenses on a piece of paper with a stamp on it. Overall I think you could probably find something that's a similiar price that will be much nicer. I wouldn't go back again. The bed was comfortable and there was free wifi. WiFi code was not at the room so I need to wait till the next morning. no elevator, my room was on 3rd floor and I had lot of luggage.